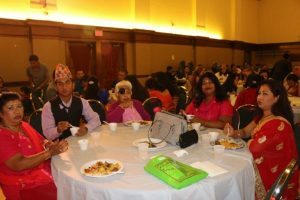 Nepali Association of Oregon (NAO) celebrated Dashian Party 2017 on Saturday, October 7, 2017. NAO General Assembly elected new executive committee for the year 2017-2019 in this party. 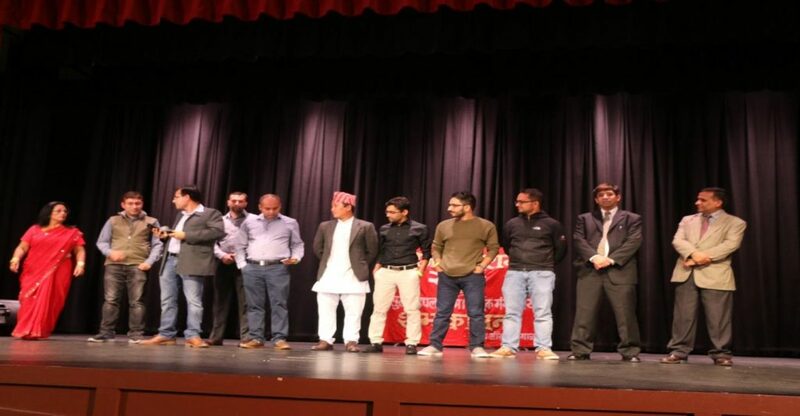 The elected new executive committee comprises Bharat Banskota-President, Pradeep Bajracharya-Vice President, Pramod Poudel-Secretary, and Bijaya Pathak-Treasurer. Anu Acharya, Kiran Adhikari, Manish Karn, Pasang Lama and Sudesh Banskota are the new executive committee members of the committee. Bharat Banskota was the president of the NAO for the term 2013-2015 as well. 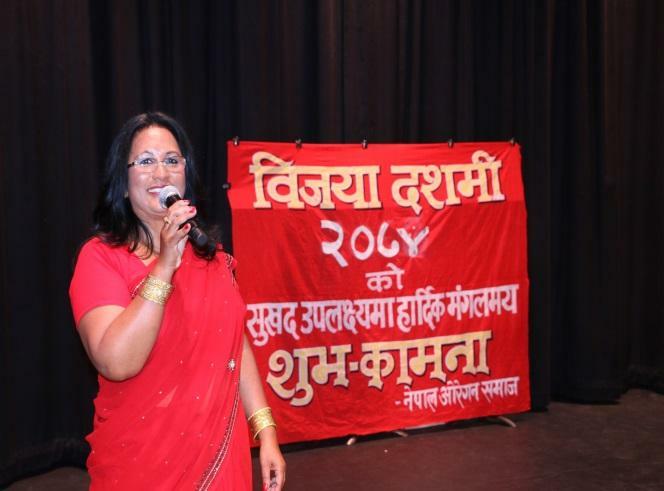 The coordinator of the NAO election committee Madhav Gautam announced the names of the elected candidate at the Dashain party event. 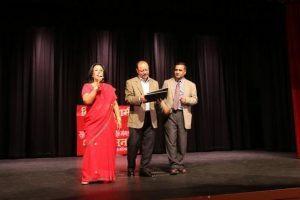 NAO outgoing President Ganga Sharma thanked her executive committee members, NAO advisors, NAO committee members and other community members for their outstanding support to make her tenure remarkable. Ms. Sharma wished success to new NAO president Bharat Banskota and his team and expressed her commitment to help new committee as in the past. NAO celebrated this year Dashian party a little differently compared to previous years. 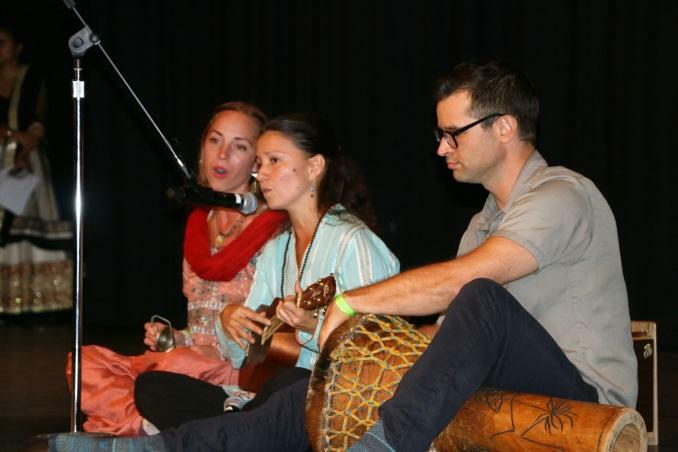 Instead of organizing the stage dance, NAO invited local organization Portland Kirtan and ask them to sing Ganesh Bhajan, Durga Bhajan and Kali Bhajan. The singer from Portland Kirtan sang those Kirtans. 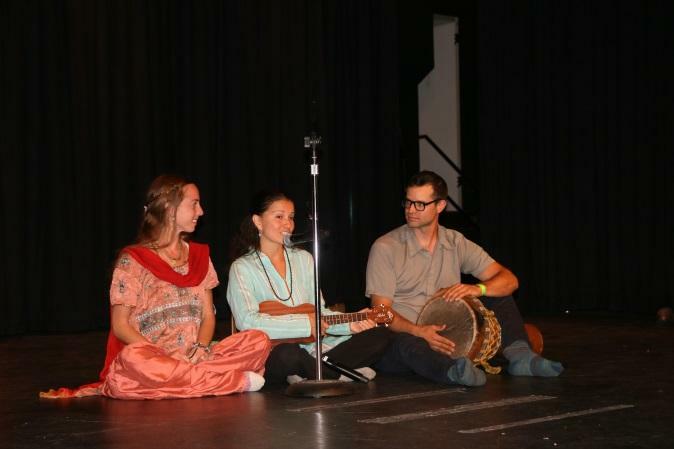 We were amazed when the local group started to sing Nepali bhajan kirtans with harmonium, tabala, sitar and jhyali. 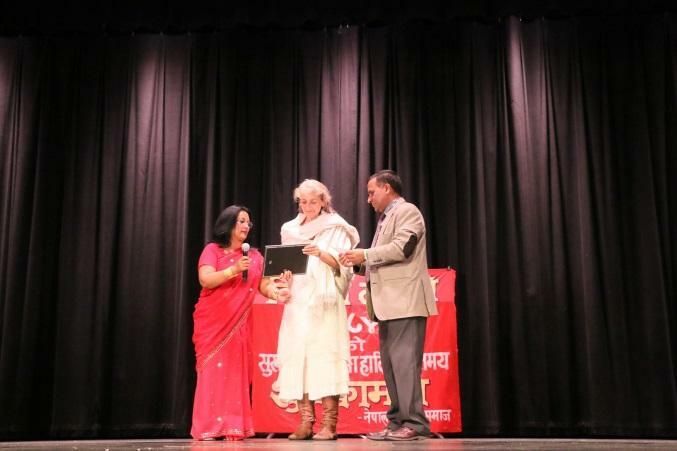 This gave our community members nostalgia of Nepal and particularly the temples of Nepal. 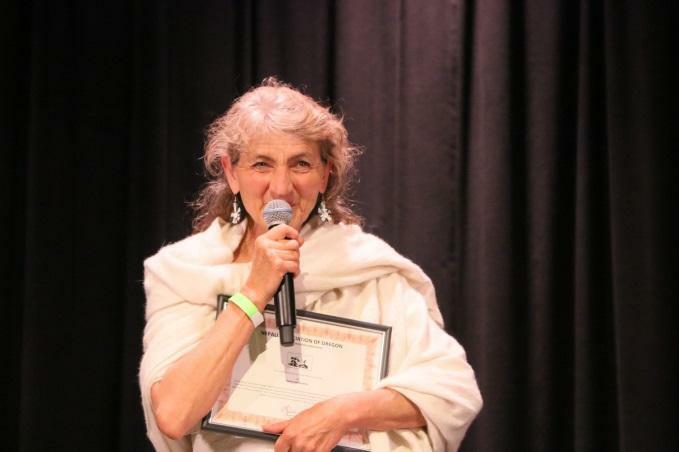 Also in the program, NAO President Ganga Sharma handed out a $500 check to Aasha Deliverance in sympathy — Aasha is the mother of one of the Portland Max incident victims, Taliesin Myrddin Namkai Meche. Taliesin, 23, was killed while protecting two young Muslim girls from a racist man on the train in Portland back in May 26, 2017. 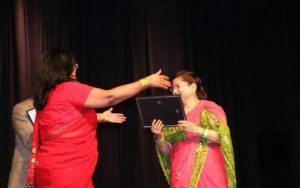 In the program, President Sharma also received $400.00 gratitude check from our community member Mina Bhirtakoti. NAO had supported Mina with $200.00 five years back when Mina was suffering from financial hardship and bad health during her first years in the US. Now, she is in a position to help NAO back due to better financial situation. Asha and Mina both addressed to the crowd. 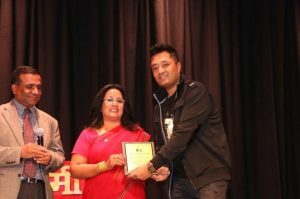 NAO Education Committee Coordinator Kush Shrestha highlighted about the $500 NAO high school excellence award 2017 and 2018. 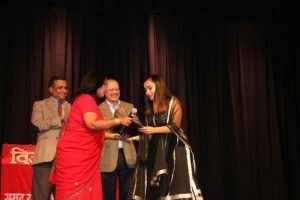 NAO President Ganga Sharma handed out NAO High School Excllence Ward 2017 to Aeijan Bajracharya (son of Ekamananda and Anjali) and NAO High School Excellence Award 2018 to Ishu Poudyal (daughter of Subhas and Indira) during the event. NAO President Ganga Sharma presented NAO Community Service Award 2017 to Prasanna Dhoj Pradhan for his outstanding contribution to the Nepalese community. NAO new president Bharat Banskota and all other newly elected officials of the NAO gave a short introduction of themselves to the crowd. 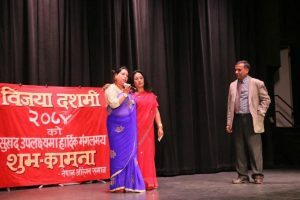 Addressing to the crowd, NAO president Banskota stated that NAO will organize more programs to preserve and promote Nepalese culture in Oregon and to support educational programs in Nepal in next two years. 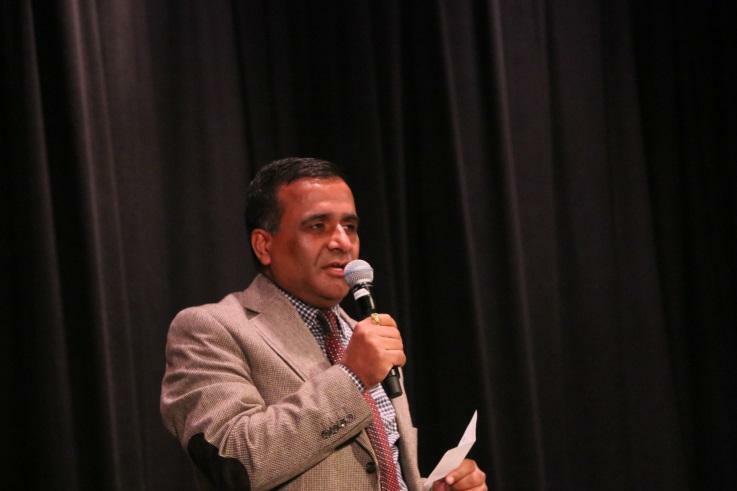 NAO new secretary Pramod Poudel introduced all of the new community members in the program. The event was organized at Multnomah Arts Center in Portland, Oregon.